Now there is a fun thumb down ghost t-shirt. The t-shirt is available for men, women, and kids and it comes in many colors and sizes. 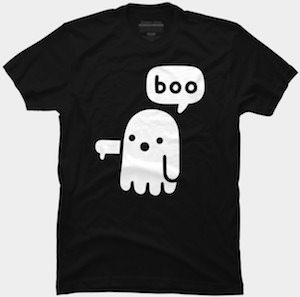 On the t-shirt you can see a white ghost and we expect it to say “boo” to scare people but this one says “boo” because it is not agreeing with things as it even gives a thumbs down. So no like button on this t-shirt but an unlike thumb of the ghost. A funny ghost t-shirt is something everyone need and not just for Halloween as ghosts are always cool. You and the whole family can enjoy this ghost so don’t wait to long.